Home»Preventative Dentistry»Should You Use Mouthwash? Mouthwash, or mouth rinses, are primarily used to remove food debris after brushing and flossing. They provide a pleasant taste, freshen the breath, and (depending on the active ingredient) can also protect against plaque & bacteria, periodontal disease, and/or cavities. So should everyone use mouthwash? Not exactly. Some people who use it will see only marginal benefits over brushing and flossing alone. 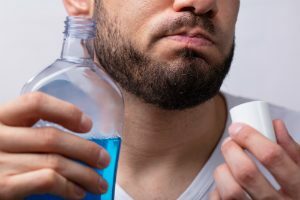 Furthermore, repeated use of alcohol-based mouthwash can irritate soft tissue, damage the mucous membrane, and contribute to dry mouth (xerostomia). Every mouth is different, so get a recommendation based on your individual needs by discussing mouthwash options with your dentist. Contact us today to schedule a consultation!